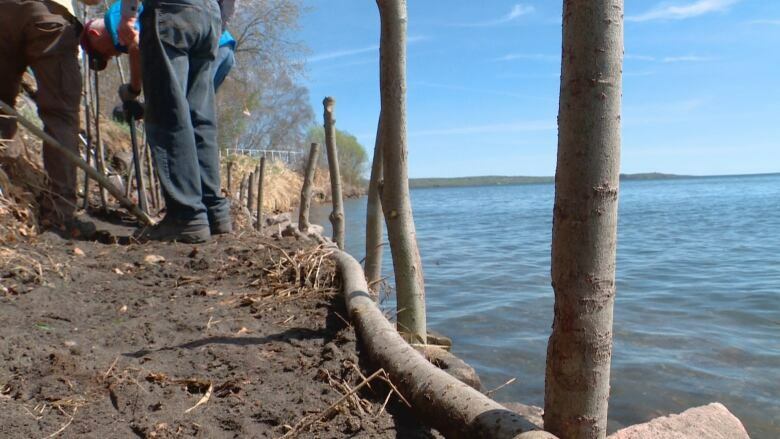 Dozens of volunteers restored a portion of the Wabamun Lake shoreline Saturday after it was torn up by massive ice heaves in January. 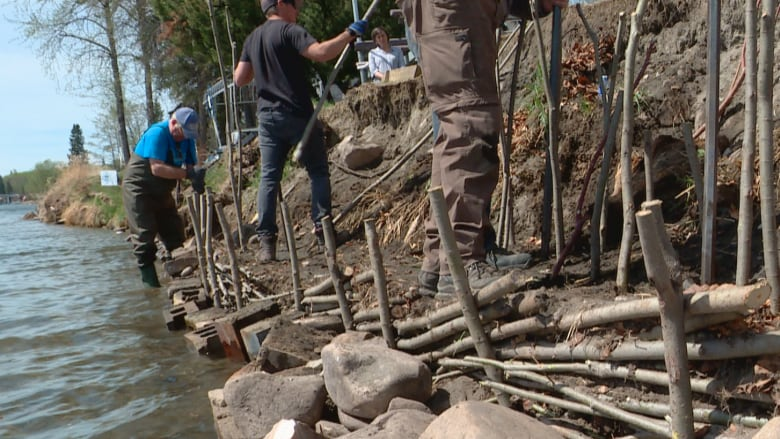 Mother Nature offered some natural solutions as dozens of volunteers spent Saturday restoring a portion of the Wabamun Lake shoreline that had been torn up by massive ice heaves in January. The group spent the day working on Irene Lamoureux's property, where masses of ice pushed back a portion of land on the shoreline by her home, creating a ridge on the edge of the property. It happened on Jan. 2, when temperatures rose from –28 C to just below freezing. "I woke up at 4:30 in the morning with a bang," Lamoureux said. "I didn't know what it was. I had no idea." What she heard was the sound of the ice expanding and jutting into the land surrounding the lake, the result of the drastic temperature change. Lamoureux said she's worried it could happen again. But Dave Polster is confident Saturday's restoration work will help prevent further damage, even if severe ice jacking happens again. The ecological restoration practitioner taught a two-day workshop, which showed 50 people how to use vegetation to secure the shoreline. 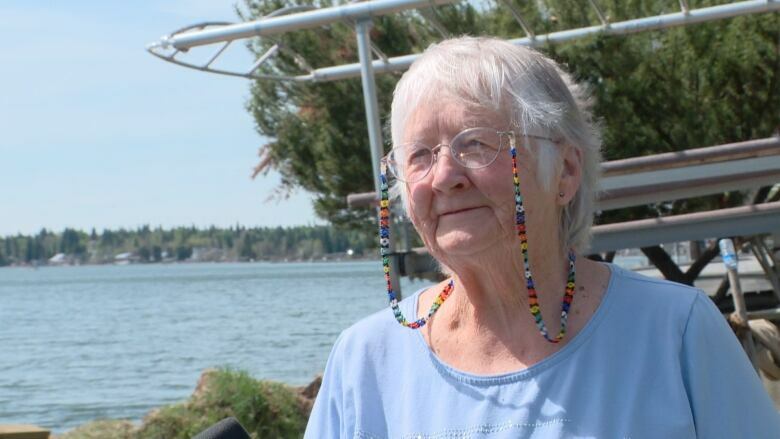 "Natural systems have been stabilizing the shorelines of Wabamun Lake for millions of years," he said. "And so if you repeat those same natural systems, you'll stabilize the shoreline." Volunteers inserted large willow sticks into the ridge on Lamoureux's property. The willow stakes will root in the sand, stabilizing the soil of the shoreline and protecting it from further damage, Polster said. He noted that willow roots are stronger than those of a spruce tree, providing a natural alternative to a retaining wall. A nearby willow bush wasn't affected by the ice heaving, he said. "The natural shoreline is resilient to those sorts of things," Polster said. "It's just when you have lawn grass down to the edge of the water, that's a problem." Volunteers also built a short fence made of willow stakes beneath the ridge on Lamoureux's property to protect the area from wave erosion. While the shoreline of Lamoureux's property has been stabilized, other properties still need to be restored. Don Meredith of the Wabamun Watershed Management Council said most of the damage is on the northwest side of the lake, and includes property and homes that were more severely affected by the ice heaves than Lamoureux's land. People who want to smooth out the shoreline instead of stabilizing it have to get permits from Alberta Environment, he said. Those who want to prevent further damage can recreate the vegetation that naturally exists along the shoreline. "What we're doing here will minimize any kind of damage from normal circumstances," Meredith said. "Of course, these years haven't been normal, so it's hard to say." Wabamun Lake is about 75 kilometres west of Edmonton.